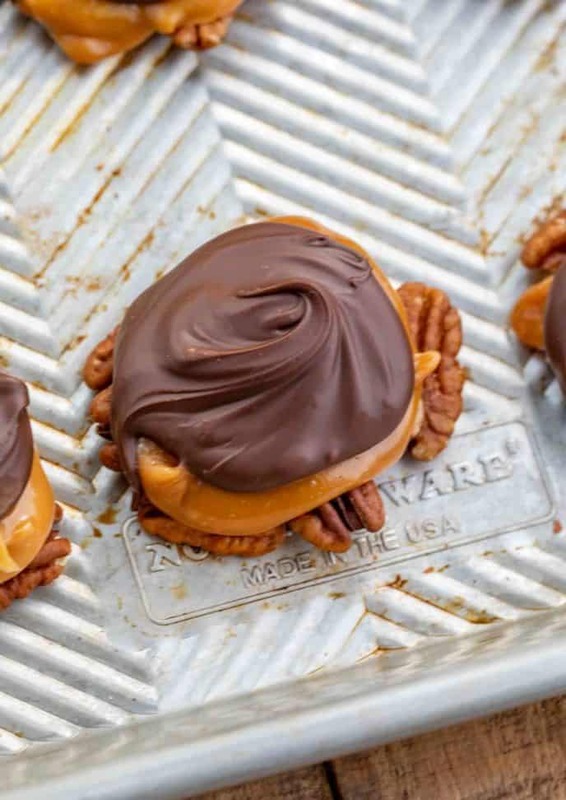 Homemade Turtle Candies are the PERFECT sweet and crunchy no-bake candy, made with melted chocolate and caramel over toasted pecans, ready in only minutes! 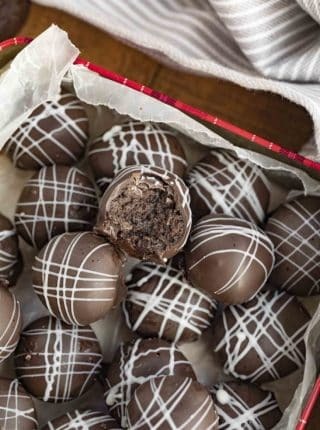 Homemade candy is easy to make and a kid-friendly fun activity, like this Oreo Balls (Oreo Truffles), Buckeye Balls, and Chocolate Truffles! 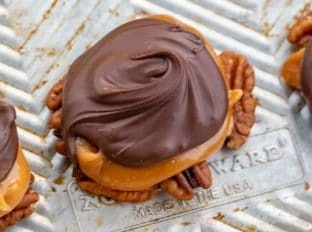 Homemade Turtle Candies are a sweet, chewy, and crunchy dessert, make with pecan clusters coated in caramel and drizzled with melted chocolate. This is the PERFECT 4-ingredient recipe to make for family and friends around the holidays, or just as a weekend treat. You can also try my Pretzel Turtles for a sweet and salty version. You can top these homemade turtles with sea salt, sprinkles, or decoratively drizzle with melted caramel. 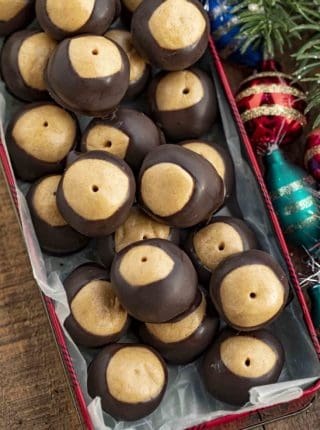 They’re a great alternative to baking, plus you can make a lot of these turtles at one time and give them out as gifts, along with my Turtle Cookies! CAN I SUBSTITUTE CARAMEL TOPPING FOR MELTED CARAMEL CANDIES? I like to use the caramel candies for this recipe because they tend to harden better, where my caramel topping often stays soft. You can make the caramel in my caramel candies recipe, but that is a lot more work than just melting the caramel candies. WHERE DO TURTLE CANDIES GET THEIR NAME? Turtle candies are playfully named for their shape, which looks like little turtles with a candy shell. WHAT ELSE CAN YOU TOP THESE TURTLES WITH? You can store these turtles at room temperature in an airtight container for 2-3 weeks. Keep them away from warm temperatures, if it’s really hot then move them to the refrigerator so the chocolate doesn’t start to melt. 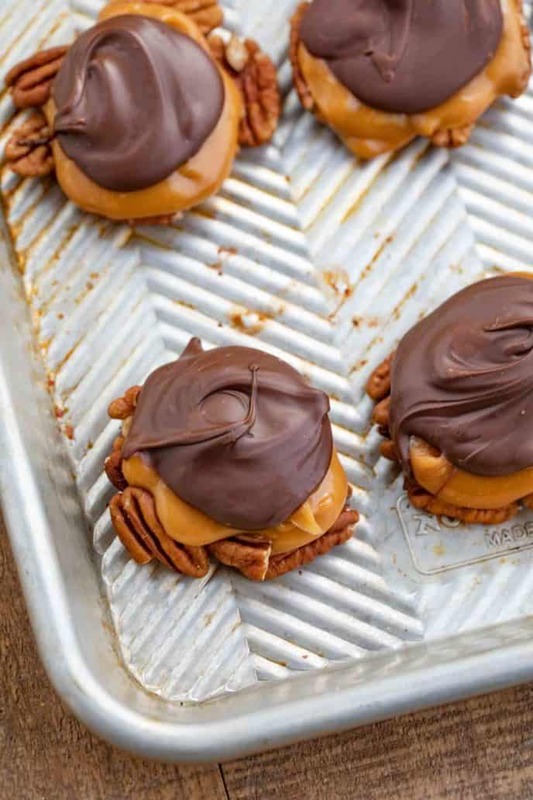 You can definitely freeze these homemade turtle candies. I like to layer them in an airtight container with parchment paper or wax paper, which prevents them from sticking together. Freeze for 2-3 months, then defrost at room temperature. Try making these with my Slow Cooker Candied Cinnamon Pecans for more flavor. You can also spoon some melted white chocolate over the dark chocolate on these candies decoratively. You can help the melted caramel or chocolate set faster by refrigerating for 15 minutes. You can use chocolate melting disks, or chocolate chips for this recipe. If you prefer baking a lot of this candy at once, you can assemble the caramels on top of the pecan clusters, then bake for 3-5 minutes at 200 degrees F, before topping with the melted chocolate. Add a few drops of coconut oil to the chocolate if it’s too lumpy to smooth it out. 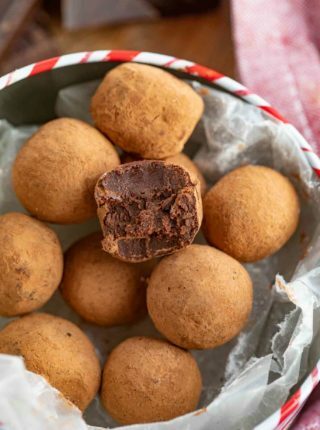 Add a teaspoon of espresso powder to the melted chocolate for a mocha version of this candy recipe. Make this recipe with dark chocolate, milk chocolate, or white chocolate. If you’d prefer white chocolate, you can also use almond bark. Toast your pecans by spreading them out on a baking sheet and bake for 5-10 minutes at 350 degrees F. Instead of baking, you can also add them to a hot non-stick skillet, stirring constantly until they are fragrant, about 5 minutes. 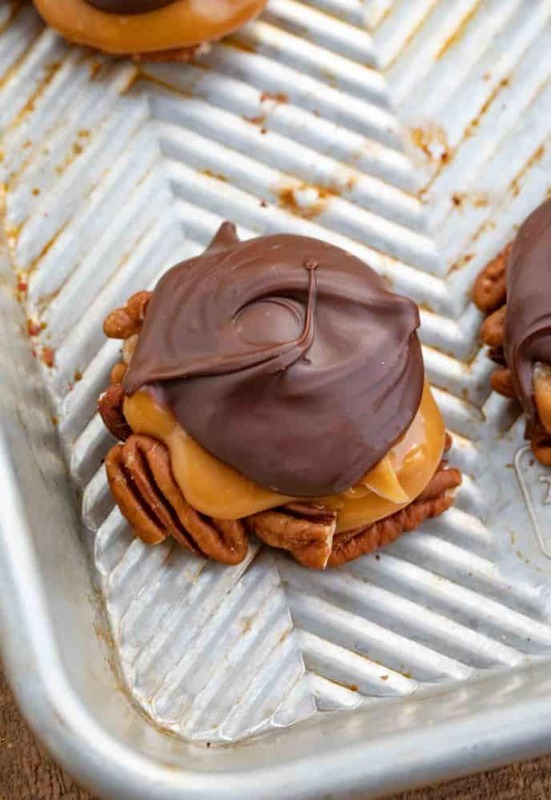 Make these turtles in the microwave by layering the pecans and caramels, then the chocolate, working in batches at 20-30 seconds at a time. Make 18 small mounds of pecans on parchment paper, roughly 4-5 pecans in each one. Add the caramels and water to a microwave safe bowl and microwave in 30 second increments until fully melted and stirred together fully. Scoop 2 teaspoons of caramel over each set of pecans then let it set for 2-3 minutes before adding melted chocolate. Melt the chocolate in a microwave safe bowl in 30 second increments until mixed completely and smooth and scoop 2 teaspoons of chocolate over each caramel cluster then allow the cluster to harden before eating. 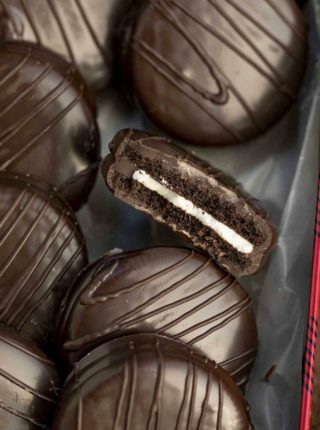 These look so delicious and I can’t wait to make them for our party this weekend! Sounds like a plan! Have fun! These looks SO good!! I can’t wait to try this recipe!! YUM! Turtles are my all time favorites!!! Nothing better then pecans, caramel and chocolate. YUM!! I make these for every holiday! They are a real favorite.